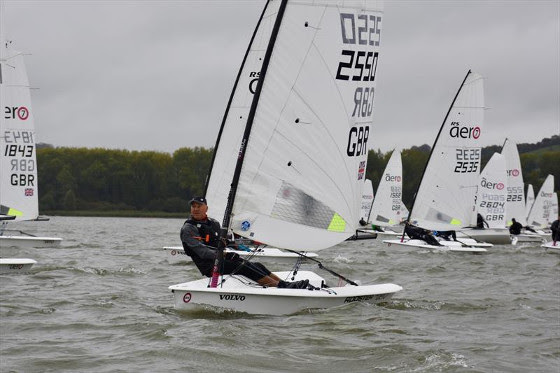 RS Aero Inland Championships – 13th/14th October… This was a challenging weekend with the Saturday being literally ‘blown off’ – during the afternoon the wind was averaging above 30knts with gusts well in excess of 40knts. All but a very few of the 56 sailors we had entered looked mightily relieved when sailing for the day was cancelled! The challenge on Sunday, when the wind interestingly had swung round 180deg. to become a 10-15knt Northerly (and it rained! ), was to try and get 4 decent races completed in time for a prize giving at 4.30pm. (Lots of sailors had travelled a long way to compete). Our RIB launching effort was greatly assisted by Bristol Water removing the large, round, fish hatchery net device which had broken free and beached on our slipway in the storm on the Friday! Thanks to brilliant organisation by Alex Timms mustering the Solo fleet volunteers, the ‘A’ team as he described them, all of the above conditions were met. The winner of the largest fleet, the ‘7’ size rigs, was Noah Rees from Torpoint Mosquito S.C. Chew’s best performers were Derian Scott finishing 3rd in the ‘5s’, and Nick Martindale who came 6th in the ‘7s’. I was so inspired by the Chew Solo fleet all stepping up to assist our event that I am now helping at the Merlin open at my home club in Lymington this Saturday! Autumn Points Series… Sunday 21st must rank as one of the nicest Autumn sailing days I can remember. A typical WSW breeze which built throughout the day and glorious warm sunshine brought lots of you onto the water. There is just one more Sunday left in this series, 04-Nov-18, for the runners and riders to consolidate their positions. Then we have the grand points totting exercise, from all the year’s series racing, to be able to award the winners with their tokens on Saturday 17–Nov-18. Get Knotted… Martyn Iain said on facebook: Some great knotwork instruction from Chris Face this morning thoroughly enjoyed by all now, is it knit one then pearl one, or the other way round…? The 200s Ugly Tour event has become a regular fixture on our calendar reflecting the continuing strength of our Chew fleet. Once again, the 100s have asked to join them and, because their Inlands were cancelled, this has become their championship. Keith Harris and the Flying Fifteen fleet are in the driving seat and I am sure they will provide and excellent day of racing. There should be plenty of room for anyone wanting to just have a sail as well. The racing will start at 12.00. The eagle-eyed among you may have noticed the arrival of a new whiteboard on a stand as you enter the Club. The idea is that Duty Officers, Race Officers and Event Organisers will have room to briefly detail what is going on at the Club that day. There is also a section to write any precautionary issues for members at the club on the day – (at the minute it is the shallow water for RIB drivers and sailors alike). Please make use of this informative facility. Allen Marsh has sent this request for help regarding pontoon maintenance. What is required is a team to react to positioning of the pontoons in relation to the water levels, and also to repair any damage due to strong winds. Ensure that your mobile or most relevant contact phone number is in the first ‘Phone’ field – it will help the OODs in their ringing around of the duty team. NB only the first phone number field is visible in the roster to a logged in member so if you want both phone numbers to be visible, you can add the second phone number in the first box with a couple of spaces between the two numbers. Ensure your membership number is present/correct. If you prefer to do duties with a particular person (eg a family member or your regular crew), enter the membership number and/or name of the person you would like to do duties in this field. I will not be using the old ‘-1’ system from now on. NB contact duties@chewvalleysailing.org.uk to get Rescue Helm and/or Race Officer ticked, and also any training you have had (PB2, CVLSC safety training, RYA Safety Boat etc), and your preferred duty days (Saturday, Sunday etc) using the new tick boxes. I can’t guarantee to honour these preferences but will try. If you ensure that your Dutyman profile is up to date it will make matching your preferred duties/days much easier and more reliable in Dutyman when I put together the next batch of duty allocations. I am also going to get rid of the postal address bit of the profile, so you shouldn’t be concerned if that bit disappears. This year we are very fortunate to have Bryony Shaw, 2008 Olympic bronze medallist, and Daisy Collingridge, a promising young Laser Radial sailor to join us for the evening. Their main purpose is to officially present the Club with our British Youth Sailing Recognised Club award. They are also going to give a brief presentation (subject to be confirmed, but may well include Bryony’s take on the recent pre-Olympic event in Japan), and of course, to present the Club Trophies.